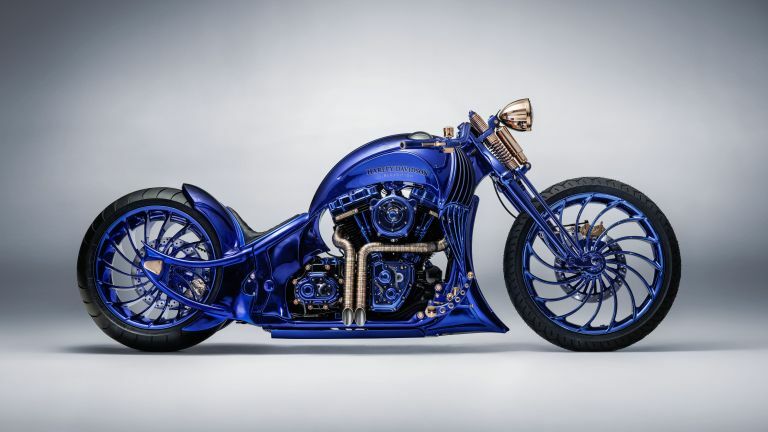 Bucherer Fine Jewellery, Carl F Bucherer watchmakers and Bündnerbike have teamed up to create the most expensive, and, perhaps most insane motorbike in the world, the Bucherer Harley Davidson Blue Edition. It's the world's first motorcycle to feature integrated watch and jewellery, and will cost 1.89M CHF (around £1.4M) to purchase. Every metal element found on this one-of-a-kind motorcycle has been produced, welded, beaten, ground and polished by hand, with various parts of the motorcycle even gold-plated. The pièce de résistance are the elaborate watch and ring holders embedded in the tank of the motorcycle. These display cases house a six-prong Heaven solitaire ring with a 5.40-carat diamond, and a custom-made watch, which is based on the Patravi TravelTec II, under an armoured glass dome. To ensure the engine vibrations don't damage the mechanical movement, the watch is housed in a cage made from silicon rings. Amazingly, this also acts as a watch winder. The Harley-Davidson Blue Edition is based on a Harley-Davidson Softail Slim S.
The 100PS motor has been illuminated with heat-resistant LEDs, making it the world’s first motorcycle to have a motor that is lit up from the inside. Perhaps the coolest detail is the iridescent paintwork. The entire motorcycle was silver-plated, before six coats of the intense blue were then applied. Fancy a more detailed look? Bucherer will open a permanent boutique in the Selfridges Wonder Room, where the motorcycle will be on display and available for purchase.